In this video, we will be learning the rules and concepts behind how to add and subtract signed numbers. Signed numbers mean positive and negative numbers. 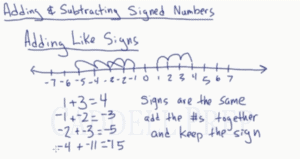 In this lesson, we’re going to discuss how to add and subtract signed numbers. This is adding and subtracting positive and negative numbers. Now, let’s get to add and subtract signed numbers. Let’s start with adding like sign numbers. This might be the easiest. Let’s draw a number line. Let’s start with a classic example. This is the addition of two positive numbers. Let’s prove if it’s true. We’ll start with and adding three more. In the number line, we end up with . Let’s see if we add negative numbers together. So, let’s start with and add more. so we’ll start at and add . We end up with in the number line. Now, let’s make sense out of this. If we add two like sign numbers, we just have to add the numbers together and keep the sign, whether positive or negative. Since the two numbers have the same sign, we just add them together and keep the negative sign. Now, let’s go over adding unlike signs. Let’s draw another number line. Now, let’s have then add . So let’s move to the left. Let’s start with then add . Let’s move to the right. In the number line, we end up in . So let’s start at in the number line and add . We get . Let’s see what the pattern is. When the signs are different, we find the difference between the numbers. So the difference between and is . And it’s negative because the bigger number is negative. In , the difference of the two numbers is . And since the bigger number is negative, the answer is negative. Here in , since they have unlike signs we have to find the difference and the answer is positive because the bigger number is positive. So the answer is . Let’s do another example without the number line. Here, we find the difference between and which is . The bigger number is positive so our answer is also positive. 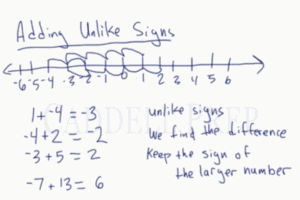 In adding unlike signs, we find the difference and we keep the sign of the larger number. Let’s go over subtracting signed numbers. We have , in the number line we end up with . , we start at and subtract going to the left. Here, we end up with . What if we have , start off at and we’re taking away. In the number line, we get . Let’s see the logic first. Let’s say you have and we took away . That’s a good thing. Maybe you owed someone and you took it away. You don’t owe someone anymore. The person said, “forget about it”. That’s like having the next since you don’t have to pay that for. So we increased to . Next, let’s say you have because you owe people . Then somehow you spend another . Maybe you borrowed this amount. So now, you owe . You actually have . Here, you’re already negative but spent some more. So you are further negative. Same thing with the third example. You’re already at but spend another . So now you owe altogether. Here, we keep the first number then change the second sign and also change the third sign. Just follow the formula: keep-change-change. Keep the first number , then change the next sign from negative to positive and then change the sign of the last number from positive to negative . Remember the rule for adding like signs? We just have to add the two numbers together and keep the sign. So our final answer is . Let’s do the third example. Again, we’re going to do keep-change-change. Keep the first one , change the negative sign to a positive and then change the positive sign to a negative in the last number. This isn’t too bad. Both numbers are postive. But we should expect the answer to be negative since we are subtracting more than what we have. Let’s solve this using keep-change-change. Keep the first number , change the next sign negative into positive and then change the positive sign of the last number to a negative sign. Just to recap, when we subtract signed numbers, we can use keep-change-change to make it an addition problem and we’re just going to use our rules in adding signed numbers. 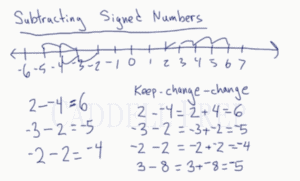 This is how to add and subtract signed numbers.